I helped to build a staff wiki out of our old card and Microsoft Word fugitive files. It aggregates difficult-to-find information and answers to common questions into a single source which all librarians, regardless of branch location or department, can update. 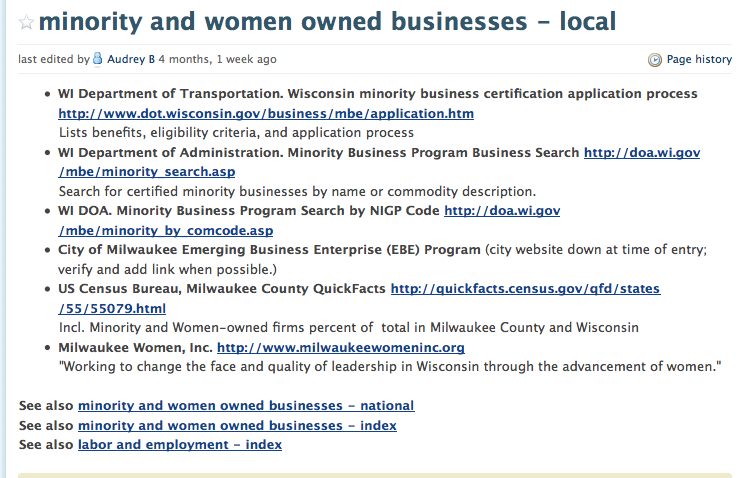 A coworker selected the platform, PBWiki, and began inputting data for her department (Humanities). I built the section for my department, Business, Science, and Technology. Approximately 300 pages of data were entered, revised for consistency, checked for accuracy, updated, and organized in a useful way. When I completed the information architecture and data entry, the library began rolling the wiki out to the rest of the librarians. The best part about this tool is that it will improve with their use as information is added and the best mapping is established. This wiki makes an incredibly large volume of important information easily and quickly accessible for all librarians, improving the service we can provide to the public. Below is a sample page from the wiki.